TruCases offer the perfect solution for storing and transporting all of your cosmetics and styling essentials in one place. Organizational compartments offer deep spaces for different types of makeup, tools and styling products. Tiered compartments allow you to arrange your case from Primer to Pallets in the order that make your services professional, seamless and well organized. Your clients don't want to see you get flustered digging through bags of make-up looking for pencils and coveted colors. Now you will have a place to keep towels, your makeup belt, brush cleaners, cape, brush rolls and more! Let your clients see you "roll up"in Tru professional syle. With a variety of cases to choose from, TruCases offer a variety of sizes from modest to impressive. 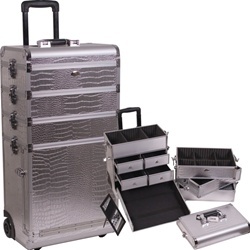 This Silver Crocodile Pro Rolling Makeup Train Case makes a st atement, especially with its dramatic crocodile texture and sleek silver color. Don't need to take it all with you? The top section can be removed and carried separately. Love that! Also great for mobile estheticans and mobile spa services. TruCases' professional designs and styles exude professionalism and class.